Blog from Te Anau, New Zealand | Margaret in Wonderlands.. The next day I woke earlish ready for the action day ahead. I completed my blog and went into town and checked out a few shops. I picked up a new pair of sunnies (4th pair and counting) and took some pictures of the lake front and statue of the founder William Rees.I met Geraldine and we went and checked in for the Shotover Jet. We got on a bus and they took us to the Shotover Canyon where we would be doing the trip. We saw some people finishing their trip and it looked fun. We basically put our belongings in a locker and out on a rainjacket and life jacket. We then went to board the boat but this annoying German guy would not let us sit together (what a tool) and insisted he sit on the edge. Honestly what happened to chivalry? Anyway it was good fun and they had heated rails so it was all cool. They did 360 degree turns and explained a bit about the history of the canyon but as I was at the back I did have difficulty hearing any of the details (I know your so disappointed). He got really close to the rock edges but I couldn't appreciate it fully as my vision was a bit blocked but it was fun to try out. We took some pictures after the trip and then went and collected a free one with a voucher I had picked up in Australia. It was a brochure for money off different things in NZ and Jess used it at the hot pools. Both places seemed confused by the brochure and I read the small print later and it actually expired September 2009 (aww well all good for us) I let Gez keep the picture as a souvenir of the trip. We headed back to town and I wandered about for an hour and a bit before I went to check in for the Canyon Swing. The girl in the office showed me a book with pictures of stars when they were younger like Rob Lowe, Andre Agassi with the bad big hair as if to take my mind off the impending swing but I was not to worried. I was more concerned that I could not seem to choose which way I wanted to do my swing. After being weighed (which really was not a good thing) and a funny tatoo on my hand I was sitting waiting to go and do my jump. There were 9 of us jumping in total. 5 from England and doing Kiwi Experience, 2 from Mexico and one from Germany. I went 4th and choose to do the backwards jump first. This one is deemed as very very very scary but I thought it would be easier then frontwards. The guy was surprised I chose that as my first ever attempt at something like that. The guys who tie you up and get you ready are real practical jokers and really try and s*** you up before you actually jump. They were pretending to push me and even joked about me doing my own safety harness which I did do and he could not 'scare' me as such. I was just waiting for them to chuck me off to be honest as they can do it. Anyway after a short while I had to lean back and then kick myself off the edge.. I was a bit nervous but managed to do it and I LOVED IT!!! It was one of the biggest rushes of my life and it was brilliant to be swinging over the canyon. On the way up I wanted to do another one but wasn't sure as I have spent so much cash but after a little persuasion from one of the guys I decided to do another one but do it front ways somehow... so another very very very scary pose later I decided to do Gimp goes to Hollywood. They basically harness you in, swing you over the edge and then you have to hoist you legs in the air over the harness and stretch your hands outright in front of you like Superman!! Or Superwoman in my case. I also had decided to try and film it with my own camera so this was taped to my wrist. I literally was upside down looking at the canyon below me and all I could see was the river and rocks, it was freaking brilliant!!! They pretended to count down but I knew they would let go before then and low behold they did...I loved this one and it was my favourite one of the two as you could see everything!! After both of these I was on a serious HIGH!! I ended up buying both sets of videos and pictures but the video I had was pretty cool as well! I WANT TO DO IT AGAIN!!!! Anyway back to town we went and I checked my video quickly and headed home to get ready for a night out. The girls were almost ready so I made some food and had a beer. They went on ahead of me so I got ready and had a few more drinks. I also did watch desperate housewives and brothers & sisters in the meanwhile. I met them in Buffalo bar which were doing $5 vodkas- SWEET! We stayed there for a few drinks then headed to Altitude and it was karaoke night there and heaving with backpackers. We stayed there for a song and left as it was not really Geraldines scene. On the way in I did bump into a guy I met on Koh Phangan called Pat so that was random. We headed for World Bar which was also packed but was playing some good music so Jess and I stayed and danced the night away. I re-met up with the guys from my plane journey to NZ Matt and Luke (both wasted and doing the Kiwi bus) They both head to South America so may see them again there somwhere. It was a really good night and a few hours later we headed for a lamb fergburger and chips to soak up some alcohol and do our steep hill walk climb home for the second time that day. The next day we woke early and went on the gondolas to the top of the mountain overlooking Queenstown. It was so foggy that morning but eventually it cleared up and we got some brilliant shots of the city and lake and surrounding areas. I went on the luges and did 5 rides. I had to get a chair lift to the top and ride down. I started on the scenic track which was longer and really pretty and then moved the the advance track which had more bumps and sharp corners. It was really fun to try it out but I was finished after 3 rides and was getting a bit bored. Those little carts can gain some speed though :) We finished up taking some pictures and then headed down and onto Te Anau. Te Anau has the largest lake in South Island and its a prime spot for people doing the Milford Sounds and Doubtful Sounds which are part of the Fiordland National park. The legend behind the lake goes something like this. There was a Mauori chief who found a watering hole. He told his wife and swore her to secrecy. However the unfaihful wife told her secret lover. He went to the spot and upon him gazing into it, it burst into a dam blooding the area... Lake Te Anau. Cute story huh :) About 3ish we arrived in Te Anau and it was a brilliant location. We were litterally on the lake front and it was stunning. We got some shopping and then headed back to chill out for a bit. After a short while Jess and I headed off walking and did 1 hour and a half where we walked to the Fiordland National Park and headed past the wildlife centre and towards the control gates. It was a gorgeous day so we got some lovely pictures. We headed back and made some dinner sitting on the balcony overlooking the lake and got chatting to 2 guys. One was from Austria and the other one Patrick was from Holland. Both very cute guys :) I spent more time talking to Patrick and we swapped our travel stories, he had been to India and Nepal and showed me some pictures. I really never get bored of hearing where people have been and go! Its brilliant. The girls headed off to bed and we stayed up for a bit and then called it a night. We might see him when we get to Mount Cook on Friday. On Wednesday we were up early to head to Milford Sounds for our boat trip at 12.30. It was a 240km round trip and it was a stunning drive, the scenary would blow your mind. Beautiful mountains, valleys, strems, lakes.. it goes on. We stopped at the Mirror Lakes and they were small but very impressive..much more still then Lake Matheson. It flows into Lake Te Anau which was about 35km away so a long way. We also had to go through a tunnel through a mountain which was really long. When we arrived we did a 20 min shorewalk and took some pictures. 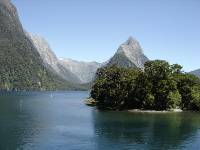 Near the docks there is a 163 metres tall waterfall which is the highest in the Fiordland National park. We got on our boat with Real Journeys and sailed into our 2.5 hour cruise. The first stop was the Mightere which is the most famous landscape in the park and where people come to see. Its a massive mountain not far up the fiord. There are all these massive mountains and its a real mix of stone, trees and even snow and glaciers on top of some of them!! Milford Sounds had massive glaciers that came through and made marks on the mountains and then eventually melted creating the fiords. There were also 2 mountains close together, one shaped like a lion and the other an elephant. Milford Sounds is the wetest place in South Island and it actually gets rain 2 days out of 3 and it was ironic that we had the most beautiful day with sunshine. All the mountains have the dents (not sure what you call them) on them so when it rains its stunning as they create temporary waterfalls. It was a real shame to miss that. We saw some fur seals chilling on the rocks as well, very cute. The walls of one of the mountains had copper in it and quartz. People used to try and take the quartz but between very bad weather and annoying sandflies it did not last very long and now the park is part of a World Heritage Centre so it cannot be touched and is protected.